I'm still recovering from our holiday in Spain — sleeping in late - cafe con leche and croissant du chocolat for breakfast, then torta of egg and mixed veggies from the Mercat la Boqueria... Then off to a fabulous artistic destination just about every morning... Not to mention where are all those tapas bars when I need a snack in the afternoon? Here we are in Bilao. 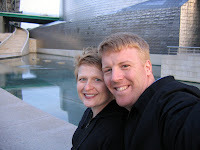 We decided to make a side trip while we were there and the Guggenheim was every bit as fantastic as I could have imagined... We even saw Jeff Koons Puppy sculpture in full bloom out front of the museum. 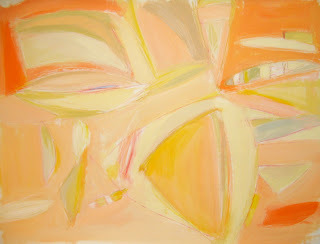 Pure delight, it was my contemporary art education come to life. 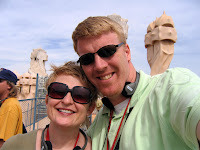 Here's a peek at Chad and I on the rooftop at Casa Mila last week in Barcelona. It was a week of great weather, sight seeing, people watching, tapas and plenty to fill my sketchbook with. Highlights for me included seeing the structures by Antoni Gaudi. I just can't get enough of his slithering shapes color palette and forms... Mostly based on nature as I discovered. I also found out he was one of the first artists to recycle, using all those bits of broken spanish mosaic shards in his work to achieve those colorful curved figures and walls. I was able to fill my sketchbook (even with one less day there thanks to usair) and am continuing to add a couple things like color and collage to finish off a few of the pages. I have 2 zip lock bags full of cards, labels, metro cards, brochures, hand written notes of restaurant recommendations, directions, contact information, maps, packaging and random spanish scraps that need to find their way into my book. And I'm sure I'll find another surprise or two as I unpack my suitcase. Next time I make a blog entry I hope this book will be filled with sketches and ideas to share from my trip to Barcelona. I made this book specifically for the trip. Having been to Barcelona many years ago - I referred to my sketches and books while I was altering the cover. That city feels layered in color, shape and energy bursting from the seams and I wanted the cover of this book to feel that way too. I searched for the right paper for weeks before I realized that altering it myself was the only way to go. I guess there's no paper out there that matches my enthusiasm for an upcoming adventure... Like a piece of paper bought off the shelf could ever do that, right? 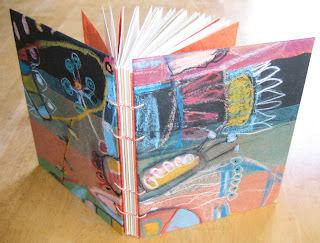 This book is bound with a 4 needle coptic stitch. Altered paper on the cover was created using caran d'ash crayons and colored pencil. The body signatures on the inside are a combination of watercolor, printmaking and handmade rice paper. Here's my latest painting - full of light, sunshine and warmth, sprinkled with a few areas of unexpected interest. The spring semester at the Corcoran has come to a close and I'm thinking about what the next few months are going to bring. How about some sunshine? For now, I'll continue my hunt for inspiration, keep working on the paintings and collages that I've started and search for a place to hang and paint large canvases. And hopefully find a few fellow artists in the process. I'm still fine tuning my summer top 10 list. My solo show at the Spectrum Gallery in Rosslyn, VA is right around the corner, I hope to have dates and times to pass along soon. The show will consist of large scale acrylic paintings, and collages on canvas and wood panels. Here's a piece I worked on last week and it's progression. It started with a pencil, ink, conte crayon and charcole drawing. 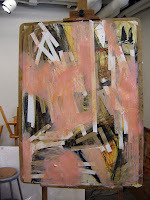 From there I applied layers of transparent paint and tape to block out area in the drawing that I wanted to maintain. And the last step was adding a selective coat of opaque paint (pink?!??!) and removing the tape. (which is also a surprise in addition to the choice of pink) As pointed out by a friend, this is clearly not my usual palette. It's back to enjoying the process I guess. While few fellow painters and viewers were wild about my new palette departure, I was thrilled with the new marks and textures I had created. I wonder where they'll turn up next? 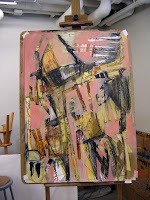 By taping off and hiding areas of the painting during the process my decisions on where to paint next became more intuitive and less planned. Felt great! Every experiment adds new knowledge to the next piece. Often I find the most challenging part is just starting a new piece (the second hardest would be finishing a piece). I'll try this approach again.